Give it low, slow cooking and you’ll be rewarded with a warming, nourishing, meltingly tender dish. As it cooks, the goodness melts out of the bone and into the meat, transferring a deeply beefy flavour into soups, stews and curries. Serves 2-3. Defrost thoroughly before cooking. Brown in a 230°C oven for 15 mins, transfer to a saucepan,add stock veg (carrots, onion, celery, leek tops), bouquet garni and peppercorns, cover with water and simmer for 3 hours, skimming from time to time. Strain, cool and skim off fat. Keep in the fridge and use by the date on the label. 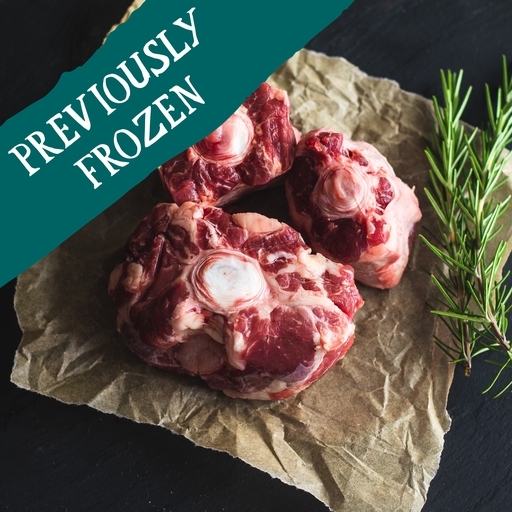 This product has been previously frozen, once thawed do not re-freeze.